If you cannot get your animal, bird, or fish to a taxidermist within a few hours, put it directly in a plastic bag or garbage bag and store it carefully in the freezer. Most animals, birds, and fish, will stay good in the freezer for up to a year when properly wrapped. First, slit the hide in a complete circle at the midpoint of the rib cage one foot behind the shoulders. Next, cut around both forelegs at the knee. 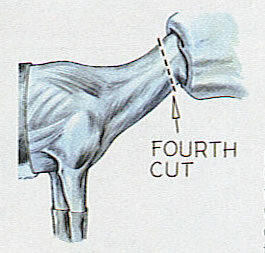 Third, make twin cuts under the chest. Start from the first circular cut around the rib cage and continue along the back of one leg to join the cut you made above the knee. Cut along where the white hair meets the brown hair on the underside of the leg. Then do the other leg. Fourth, Peel the skin forward up to the back of the ears using your knife as little as possible to avoid nicks. 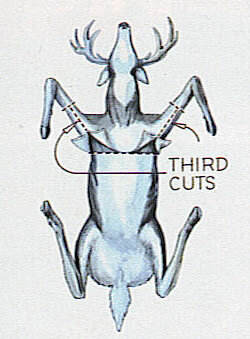 holding the skin out of the way, cut through the neck 3 inches behind the head-neck junction. Twist off the head, complete with antlers and cape. Check the fur for primness. The best fur will be from November through February for animals such as coyotes. Small game coyote or smaller can be placed in a garbage bag and frozen immediately. Do not drag big game such as bear or deer on the ground; this causes burn marks on the fur. They should be gutted and skinned immediately. Lay the skin out in the freezer for several hours to cool then roll up in a garbage bag to freeze solid. 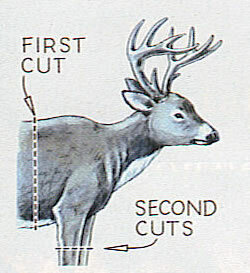 Contact me for more detailed instructions before your hunting trip. Check birds for pinfeathers. This type of feather falls out rather easily. Birds taken in October and early November will most likely have pinfeathers. These birds make a poor candidate for taxidermy. Wipe off excess blood and mae sure the head is tucked under a wing. The feathers should not be ruffled. If it is a pheasant or turkey, be careful not to bend the tail feathers. Lay them straight and sandwich them between two pieces of cardboard. Place birds in garbage bags and store in a freezer. Waterfowl and upland game can also be wrapped in saran wrap prior to freezing. I require a nice closeup photo and measurements for all fish. Measure the length from the tip of the nose to the tip of the tail. For reproductions, I also need a weight and girth measurement. For skin mounts, wrap fish in a cold wet towel and place them in a garbage bag to store in a freezer. Fish may lay flat or curled up.